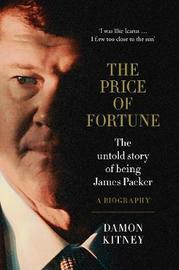 The biography of James Packer. James Packer turns to Greek mythology in an attempt to explain the most exciting yet tumultuous period of his 50 years on earth. "I was like Icarus," the billionaire tells his biographer, journalist Damon Kitney, of the heady days of 2016 when he broke up with pop star Mariah Carey, abandoned living in Hollywood and Israel, left the global casino stage, and divided the family fortune in a bitter separation from his sister. "I flew too close to the sun." With these words, Packer delves for the first time into the story behind his stunning public revelation in mid-March 2018 of his battle with mental health issues, which forced him to resign from the board of the Crown casino company he owns and loves. Never before has a member of the Packer family co-operated with a writer to tell their story. In his biography, The Price of Fortune, one of the nation's richest and most psychoanalysed men opens up in an attempt to make sense of his rollercoaster life and to tell the human story of being James Douglas Packer. Of how his wealth, charm and intellect took him to such exciting places. Yet how sometimes his trusting the wrong people and his rash actions cost him his friends, his health and, most importantly, his reputation on the global stage - and how he is now working on getting it back.